A surprising trends has emerged when comparing the labor force participation rate of those with a college degree or higher versus high school dropouts. As the chart below shows, over the past 2 decades, the participation rate of college graduates has been steadily declining. 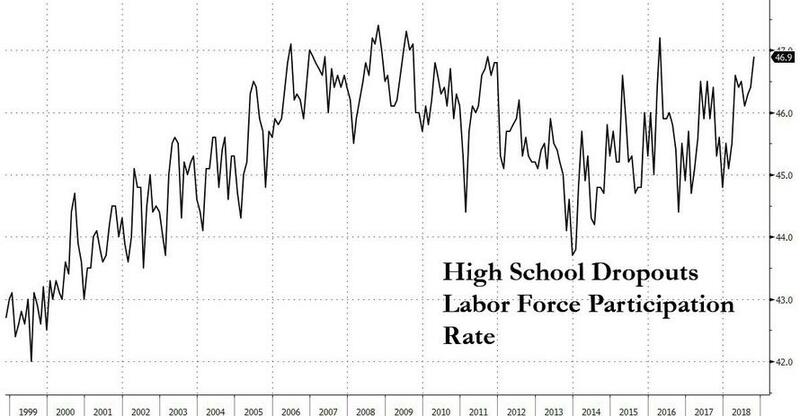 At the same time, the LFPR of high school dropouts - those with less than a high school education - has been rising ever since the mid 1990s, and is now just why of all time highs hit during the peak of the financial crisis. To be sure, there are many ways to analyze, or spin, this data: college grads are getting older and as a result of hitting their retirement years, are dropping out of the broader labor force at an accelerating rate. Meanwhile, high school dropouts, mostly younger people, do not face the same demographic pressures and continue to gain "market share." Alternatively, high school dropouts are increasingly in demand due to their non-existent wage demand leverage while college grads are increasingly pricing themselves out of the job market; Or simply employers don't need to hire as many college grads and would rather hire cheap, unqualified, easily accessible workers whom they then train for their specific needs. 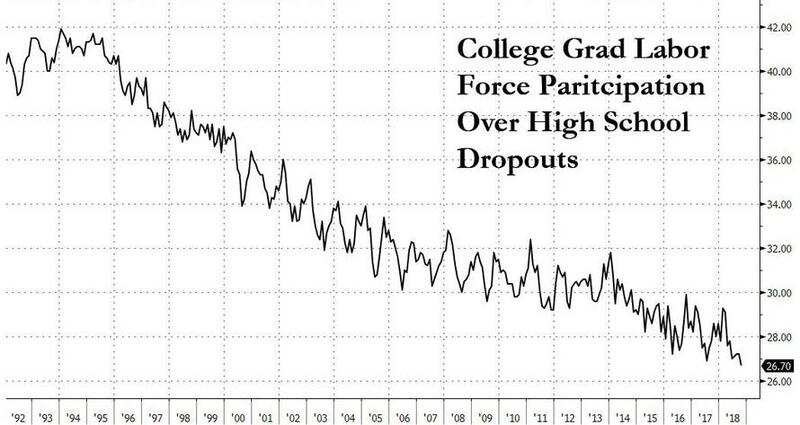 Whatever the reason, the difference in the labor force participation between college grads and high school dropouts has never been lower. Extending and extrapolating this trend suggests that some time over the next two decades, the labor force participation rate of high school dropouts in the US labor pool may be the same, if not higher, than that of college grads. 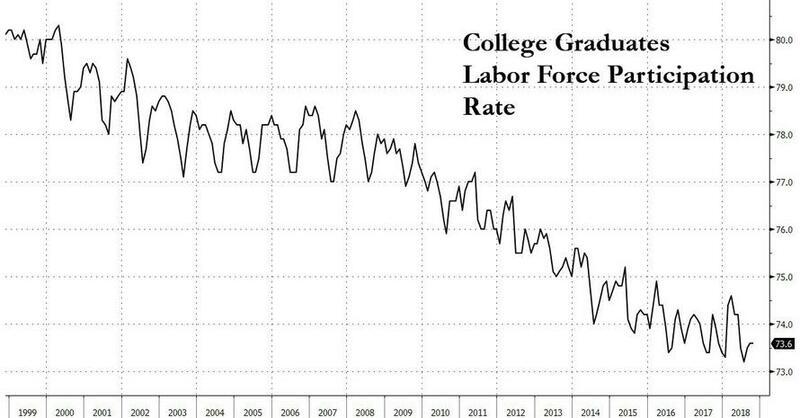 And while one can debate what is causing this troubling compression, the implications for future US productivity should the US labor force become increasing saturated with minimally skilled workers at the expense of qualified college grads, is rather dire. Then again, Bloomberg has yet to start tracking the labor force participation rate of robots: something tells us that the growth rate in this category will soon be off the charts.